Andy Gronik, a Wisconsin businessman and potential Democratic candidate for governor in the state, is using his "social welfare organization" to promote his possible candidacy. The Republican Party of Wisconsin has filed a complaint alleging that Gronik committed a campaign violation by conducting a poll of Wisconsin voters before officially setting up a campaign committee. Gronik recently founded StageW, a Milwaukee-based nonprofit grassroots social welfare organization. The group carries a mission of "bridging the political divide." "StageW brings WisconsinAlive by bridging the political divide. We are a grassroots section 501(c)(4) nonprofit that activates the best ideas no matter where they come from," the group's website states. "We bring courage and fresh thinking to complicated social issues that divide our state and set a new tone so people can come together around plans that make living here better for everyone." Gronik, who has repeatedly expressed interest in running against Republican Gov. Scott Walker, has used his organization to push his potential candidacy and support Democrats despite his group's stated mission of "bridging" the divide. StageW's website features an interview Gronik conducted with WisPolitics.com regarding his desire to run for office. A handout from StageW additionally reads as a promotion of Gronik's resume, with just a single paragraph talking about his organization. The group's Twitter account, which features a headshot of Gronik, has repeatedly tweeted about his potential candidacy while taking jabs at Walker. Gronik has also used to the account to promote Democratic Sen. Tammy Baldwin and Rep. Gwen Moore, both of Wisconsin, and their support of Obamacare. It is unclear exactly what his organization does. Gronik did not return requests for comment. Gronik has come under fire in recent weeks for commissioning and paying for a poll of Wisconsinites, who he referred to as ‘Wisconsinians' in the poll, to gauge his viability as a candidate. Gronik's survey additionally asked residents for their thoughts on political issues such as tax increases and the state's school voucher program. The Republican Party of Wisconsin filed a complaint with Wisconsin's Ethics Commission alleging that Gronik had committed a campaign violation by not establishing a campaign committee before conducting the poll. 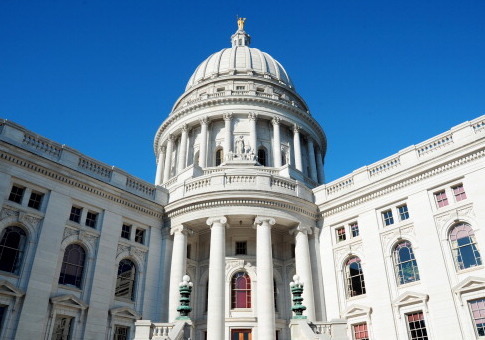 "Wisconsin law is very clear in its prohibition on candidates collecting or spending any money to further their election to state or local office without first registering a campaign committee," the complaint reads. "Upon information and belief, commissioning a voter survey to acquire voters' opinions on Gronik's electability and attitudes towards several politicized issues relating to the 2018 gubernatorial election was unquestionably done for the purporse of affecting Gronik's election to state office, specifically the nomination for Governor." The complaint states that there is sufficient evidence that Gronik has willfully and intentionally acted to "circumvent measures that require transparency in the electoral process." Alec Zimmerman, the spokesman for the Republican Party of Wisconsin, said Gronik owes the people of Wisconsin an explanation for his actions. "Andy Gronik owes ‘Wisconsinians' an explanation for why he began his campaign like an out-of-touch con artist and now is hiding from the public," Zimmerman told the Washington Free Beacon. "He's failed to answer any questions surrounding his secret poll or his shadowy organization, Stage W, proving right from the beginning that Wisconsin families can’t trust him."